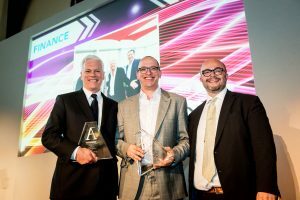 LONDON – Delta and joint venture partner Virgin Atlantic were jointly awarded Airline Business Magazine’s Aviation Strategy Award for Finance at a ceremony Sunday night. The award was made in recognition of the financial strategy behind Delta’s 49 percent stake in Virgin, as well as the success of the airlines’ joint venture partnership. Delta by Bill Carroll, S.V.P. – Finance and Controller, with Virgin’s Shai Weiss, Chief Financial Officer and E.V.P., accepted the award at an event in London. The 15-year-old Aviation Strategy Awards were founded to recognize the crucial role that management talent plays in shaping the success of the industry. With categories including Executive Leadership, Finance, Low-Cost Leadership, Marketing, Regional Leadership, and Network Strategy, they are judged by a panel of industry experts made up of members of Flight Global’s editorial team, former airline CEOs and aviation analysts. This is the second Aviation Strategy honor for Delta. Former CEO Richard Anderson, now executive Chairman of the Board, was recognized for his leadership in 2010 when he received the Executive Strategy Award. Pictured above from left to right: Delta’s Carroll, Virgin’s Weiss and Chris Flook, FlightGlobal Managing Director.